Home News Get your squeeze on! We play the Cotati Accordion Festival this Sunday at 1PM. This two-day festival is one of the very best local live music events. Don’t miss it! We have new beautiful t-shirts that we will be selling along with our CDs. So come by and say hi before or after we play. And the new 2011 Accordion Babes Album and Pin Up Calendar will be available. Children under 16 (w/ adult) are FREE! 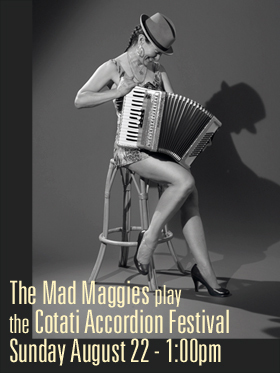 accordion babes, accordions, big fun, Cotati Accordion Festival, dance, live music, the mad maggies. CAF ’10 = Big Fun!